Originally created in 1927, Eau de Cologne is a classic citrus with subtle ripples of powdered orange and aromatic rosemary. Lithe and highly polished, Eau de Cologne resonates with nostalgia for the bygone jazz age and the glitter of patent dancing shoes. Size: 100ml / 3.4 fl oz natural spray; unboxed as shown. Made in England. 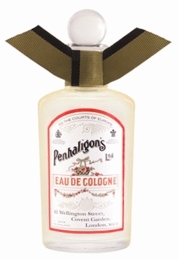 Eau de Cologne was originally created in 1927 and has been resurrected as part of our 2010 Anthology Collection.